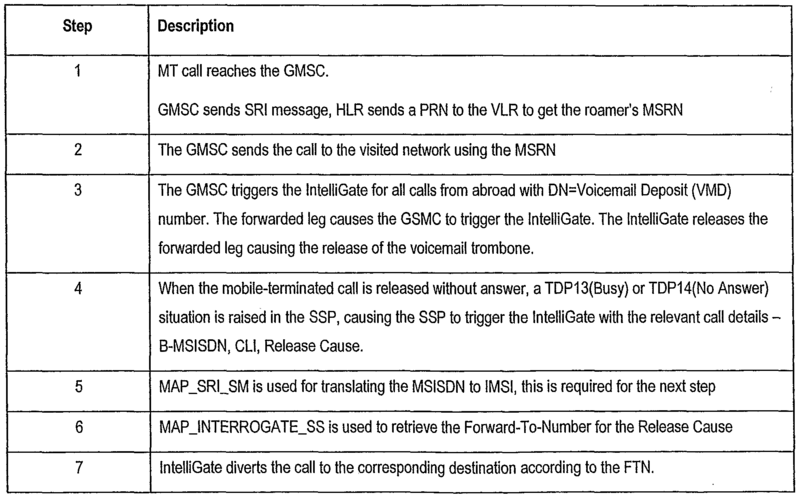 Apparatus and method for management of optimal voicemail deposit to the voicemail of a currently roaming mobile telephony user during late call forwarding, is located at the user's home network and includes a disconnection unit for disconnecting an international link upon detection of late call forwarding; a triggering unit that ensures that a trigger signal is available for triggering the passing of control of the call to allow direct forwarding of the caller to the voicemail; and a direct forwarding unit that receives the control and carries out the forwarding. Generally the roaming user only generates a single trigger, and this causes difficulties if multiple services need triggering for the same call, such as a prepaid unit and the optimal voicemail deposit. The disclosure teaches methods which when used in combination provide a system that can operate at the home network irrespective of the configuration of the roaming network. FIELD AND BACKGROUND OF THE INVENTION The present invention relates to an optimal voicemail deposit system for a roaming user whose voicemail is on a home network, which is different from the network where he is currently roaming, and, more particularly, but not exclusively to an optimal voicemail deposit system which is suitable for both prepaid and postpaid users. Mobile subscribers usually set call forwarding to the voicemail, so that if they cannot answer a call for whatever reason, then the caller has an opportunity to leave them a message. Call forwarding may be divided into two categories, early call forwarding and late call forwarding. Late call forwarding is performed conditionally, due to the subscriber's inability to answer a call routed to the handset. Conversely, early call forwarding is performed without the network attempting to route the call to the handset. This happens when the handset is shut off or when the subscriber requests unconditional forwarding of all incoming calls. Late Call Forwarding for busy/no- answer/not-reachable conditions can be configured to any number and is usually configured to the subscriber's voice mailbox. Mobile subscribers roaming abroad want to stay in touch with work and home, and to continue to use their mobile services, such as voicemail. Naturally, they also want the same user experience as that in the home network - such as seamless caller access to mailbox, caller-ID indication upon retrieval and direct forwarding of calls to their voice mailbox or to any of their pre-set forwarding destinations. It goes without saying that they expect the same user experience for their callers. However, when a roamer cannot take a call, he may either be unavailable, busy or simply may choose not to answer — the visited network routes the call back to the home voicemail system, which is the default setting for most roamers. As the originating call was most probably made in the home network, the rerouting in turn causes inefficient international tromboning, that is to say the call is connected from the home country to the roaming country and back to the home country. The result is that the called party has to pay for two International legs, resulting in a negative impact on the caller and in subscriber experience and forces roamers to pay international tariffs for voicemail deposits. Fig. 1 illustrates the existing non-optimal routing late call forwarding while roaming. The figure shows a home network 10 and a visited network 12. A call originates at the home network and is forwarded to the roaming user at the visited network. The user at the visited network does not answer the call, and the call is routed from the visited network to the user's voicemail at voicemail server 14 at the home network 10. At this point two international connections 16 and 18 simultaneously exist for the same call. Higher subscriber costs — The high cost to the user caused by the international tromboning of voicemail causes many roamers to disable voicemail forwarding while roaming. Some home networks disable call forwarding for their outbound roaming subscribers, in order to avoid subscriber frustration. Complicated use - Due to the filtering of signaling data by switch vendors and by some international networks, the original dialed number may not be transferred to the home network's voicemail system via these doubled International links. This forces the caller to re-enter the original dialed number. For the same reason, Caller ID is not available to the voicemail system and the phone number of the caller is not provided during message retrieval, resulting in a voicemail message whose origin cannot be traced if not self-explanatory from the message itself. Higher operator costs — Roaming subscribers, unaware of the high cost of forwarding calls, may be surprised and angered when receiving their monthly bills. The immediate response is usually to call Customer Care to complain and inquire about the charges. In addition to customer dissatisfaction, this in turn engages operator's manpower and communications resources. There is thus a widely recognized need for, and it would be highly advantageous to have, a late call forwarding system for roaming users which is devoid of the above limitations. SUMMARY OF THE INVENTION According to one aspect of the present invention there is provided apparatus for management of optimal voicemail deposit to the voicemail of currently roaming mobile telephony user during late call forwarding, the apparatus being located at the home network of said user, the apparatus comprising: a triggering unit configured to set a trigger for a mobile terminated call directed to a subscriber of the home network roaming in a visited network, such that when the call is disconnected, the control of the call is handed over for direct forwarding, said setting being irrespective of triggering being required for other purposes; a disconnection unit for disconnecting an international link in a mobile terminated call following subjecting of said call to a late call forwarding; a direct forwarding unit for forwarding a caller to said voicemail, thereby providing an optimal voicemail deposit. According to a second aspect of the present invention there is provided a method for management of optimal voicemail deposit to the voicemail of currently roaming mobile telephony user during late call forwarding, the method being carried out at the home network of said user, the method comprising: providing a trigger signal for passing control of a late forwarded call to allow direct forwarding to a respective voicemail; disconnecting an international link associated with said call; and using said trigger making said direct forwarding to said voicemail. Unless otherwise defined, all technical and scientific terms used herein have the same meaning as commonly understood by one of ordinary skill in the art to which this invention belongs. The materials, methods, and examples provided herein are illustrative only and not intended to be limiting. Implementation of the method and system of the present invention involves performing or completing certain selected tasks or steps manually, automatically, or a combination thereof. Moreover, according to actual instrumentation and equipment of preferred embodiments of the method and system of the present invention, several selected steps could be implemented by hardware or by software on any operating system of any firmware or a combination thereof. For example, as hardware, selected steps of the invention could be implemented as a chip or a circuit. As software, selected steps of the invention could be implemented as a plurality of software instructions being executed by a computer using any suitable operating system. In any case, selected steps of the method and system of the invention could be described as being performed by a data processor, such as a computing platform for executing a plurality of instructions. Fig. 1 is a simplified diagram showing existing voicemail deposit architectures including a double International leg or tromboning. Fig. 2 is a simplified diagram showing a system architecture to which the present embodiments may be applied. Fig. 3 is a simplified flow diagram illustrating the process of voicemail deposit according to a first preferred embodiment of the present invention. Fig. 4 is a simplified service flow chart showing optimal voicemail deposit for a postpaid user, according to a preferred embodiment of the present invention based on double triggering. Fig. 5 is a simplified service flow chart showing optimal voicemail deposit for a prepaid user in a Camel enabled roaming network, according to the double triggering embodiment of Fig. 4. Fig. 6 is a simplified diagram showing double triggering for a prepaid roamer in a non-Camel enabled network, according to the embodiment of Fig. 4. Fig. 7 illustrates the service flow for a prepaid user in a Camel enabled roaming network according to a preferred embodiment of the present invention based on an IN service broker. Fig. 8 illustrates the service flow for a prepaid user in a non-Camel enabled network according to the IN service broker embodiment of Fig. 7. Fig. 9 is a simplified service flow diagram for a postpaid user in either a Camel enabled or non-enabled visited network, according to a preferred embodiment of the present invention in which call status triggers are used. Fig 10 is a simplified service flow diagram for a prepaid user in a Camel enabled visited network, according to the embodiment of Fig. 9 in which call status triggers are used. Fig. 11 is a simplified flow diagram for a postpaid roaming user in a non-camel enabled visited network, according to a preferred embodiment of the present invention that uses a SOR emulator based on probes, specifically an SS7 probe. Fig. 12 is postpaid roaming user in a non-camel enabled visited network, according to the embodiment of Fig. 11 that uses a SOR emulator but this time based specifically on an SCCP relay. DESCRIPTION OF THE PREFERRED EMBODIMENTS The present embodiments comprise apparatus and methods for alerting the home network about call forwarding involving a roamer so that the home network can forward the caller directly to the voicemail and disconnect the International link. In this way not only is tromboning avoided, but also the connection to the voicemail works better because the caller ID is correctly forwarded to the voicemail. The GSM standard includes features to avoid International tromboning but these have never effectively been implemented. The present inventors, in one embodiment, instead of relying on the eventual implementation of these features, make use of the roaming trigger that the home network in fact does issue. This raises the problem that the roaming trigger may be required for other purposes, in particular for alerting the system in the case of a pre-paid subscriber to ensure that his prepayment covers the roaming interaction. The present inventors have inter alia solved the problem in such a way that call forwarding to the voicemail is carried out regardless of other requirements of the roaming trigger. As a result there is a call forwarding system that is equally applicable to pre-paid and post-paid users. * Direct forwarding - The caller receives direct in-network access to the forwarded destination, whatever number is dialed — mobile or fixed — or to the called party's voice mailbox. No international calls are implicated. * Home-like user experience - When forwarding the call to the voicemail, the application makes the original called number and calling party's number available to the voicemail system. This in turn ensures a positive user experience, both for the subscriber and the caller. * Increased call completion rate - Without international call rates, late call forwarding, while roaming, helps callers complete more calls and encourages subscribers to activate their voicemail for message deposits, thereby further increasing the call completion rate. This in turn increases the number of voicemail retrieval calls and callbacks. * No dependencies on visited network - various of the embodiments presented herein do not require any coordination or interoperability with the visited networks. A single solution at the home network suits all visited networks. The principles and operation of an apparatus and method according to the present invention may be better understood with reference to the drawings and accompanying description. Register 26 to obtain routing information, that is to say to locate the mobile telephone required and communicate with it. In the case of International roaming, the HLR is beingused to find the roaming network. Based on these two alternative signaling methods, the present embodiments provide a generic technical solution for the service. The final delivered solution to the operator however, is preferably adjusted to the specific network configuration and parameters, such as: network size and topology, traffic volume, INAP vendor's variant, CAMEL version - if relevant and to the operator's preferences. All these parameters are usually discussed prior to specifying the final technical solution. Reference is now made to Fig. 3 which is a simplified flow chart showing OVMD in action. A call is placed and not answered. The solutions discussed herein include two stages. A first stage involves disconnecting the trombone and the second involves obtaining a trigger. In the following are provided four methods for obtaining a trigger, and then three methods for disconnecting the trombone. The issues of disconnecting the trombone and obtaining the trigger may be considered separately. The disconnecting of the trombone can be either by capturing the call with the VM deposit number, or by operating in association with the FTN (Forward-To-Number), as described in greater detail below. A first solution for obtaining a trigger is simply to provide a double trigger. The DP 12 trigger is the trigger provided by the IN for an MT (Mobile Terminated) call. The DP 12 trigger is used by the prepaid system if the MT is directed to a roaming subscriber. Double triggering is possible at the local MSC based on the ability of the switch at the home network to send the trigger twice, that is to two different addresses. The idea is that one address used is the prepaid feature or any other feature needed by the specific user, and the second address is the anti-tromboning feature which is described in greater detail elsewhere herein. The anti-tromboning feature once triggered is able to cut the International links and forward the caller directly to the voicemail as necessary. In fact, the double trigger may be intended as part of the CAMEL system for inbound roamers. The present system for the first time utilizes the trigger for outbound roarners. However, the double trigger solution does not have to be CAMEL. The switch need only have Intelligent Network (IN), with double triggering support. Double triggering support includes a prefix that can be added after the first trigger, in order to process the second trigger. A difficulty with the double trigger solution is that it is not widely available, in that many switches are unable to produce a roaming trigger that can be directed to two addresses. A comprehensive solution utilizes the double trigger where available but requires other solutions for other cases. A second solution uses a software or firmware entity referred to as a broker. A broker can be provided as part of the Intelligent Network IN system for cellular networks. This is referred to hereinbelow as the IN service broker. A regular trigger is used, and the broker is provided as the single address by the trigger. The broker receives the trigger and looks at the service profile for the associated callee. Based on the callee the broker then decides what to do with the trigger. If the user is a prepaid user then the broker sends its own trigger to the prepaid system, and the broker retains the ability to trigger the anti-tromboning and voicemail deposit. The caller profile can be used to allow a range of features for the roaming user, in that the profile allows the broker to make a decision which is as simple or complex as necessary to trigger any combination of services for the roaming user. A prepaid user would automatically have a trigger provided to the prepaid system but users in general could have triggers provided to any IN services relevant for the current call. A third solution makes use of call status triggers. 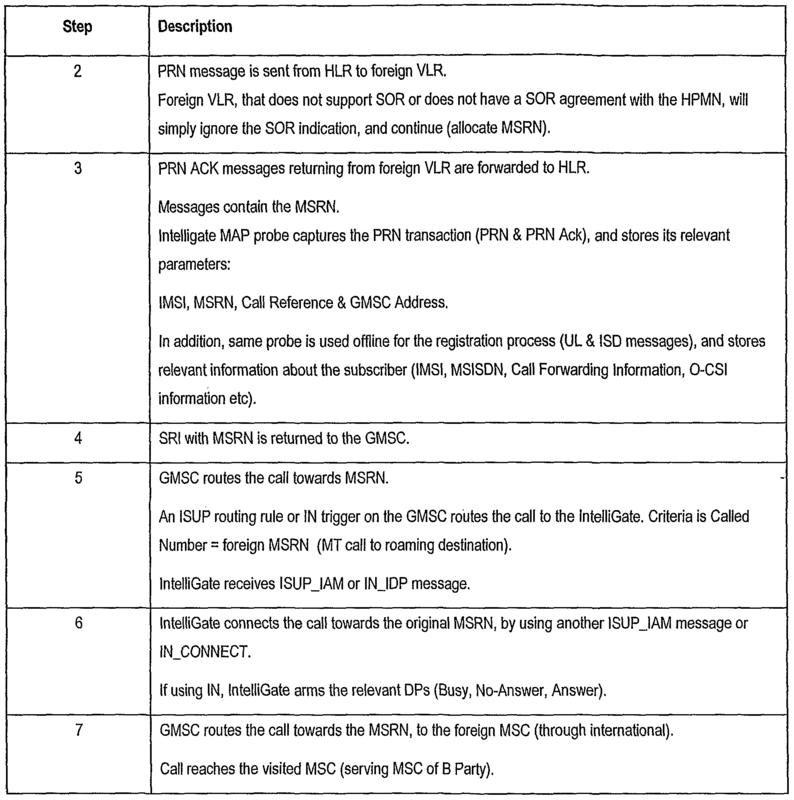 A set of what may be termed late call triggers, because they occur after the call has begun, may be used. Such triggers include the "no answer" notification, the "busy" notification etc. The call goes to the prepaid system in the normal way using the roaming trigger. Likewise the call is forwarded to the callee, who does not answer etc. The no-answer status returns to the home network, which can now be used to trigger the anti-tromboning system, and direct it to disconnect the International branch of the call at the gateway, and forward the caller directly to the voicemail. A busy notification may likewise be used as a trigger for the anti-tromboning feature. The busy trigger also reaches the home network. In either case, on receipt of the notification, the system has to determine if there is a voicemail to forward the call to. The voicemail is defined by a forward to number (FTN). In fact it should be noted that users on many systems are free to define other numbers to which their calls can be forwarded, not just voicemail, and the present embodiments encompass forwarding of calls to these numbers as well. The FTN is obtained from the home location register (HLR) of the callee. If there is no FTN defined then the call is disconnected. It is noted that a call being forwarded to a voicemail includes a notification in its header that it is for voicemail. Thus the very presence of a call with a voicemail deposit notification in its header may be used to trigger the anti-tromboning feature. As above, once triggered, the anti-tromboning feature may disconnect the International call and subsequently allow connection of the caller to the callee's voicemail. The anti-tromboning feature is responsible for the trombone disconnect, but it is noted that the forwarding to the voicemail is done by another component, the component that receives the trigger, checks the FTN and then decides if or where to route the call. In general, when a call is forwarded back to the home network with a voicemail notification, and disconnected by the anti-tromboning feature, then a TDP13/14 trigger at the MSC enquires what to do with the call. As long as the TDP13 is answered within a certain time delay then the call can be handled. If not then the call is cut off. It is added that some roaming network switches do not release the call on time. A workaround can be provided by playing a ring back tone from the Intelligate. The ring back tone operates to prevent the home MSC from disconnecting the call until the release trigger is received from the visited network. 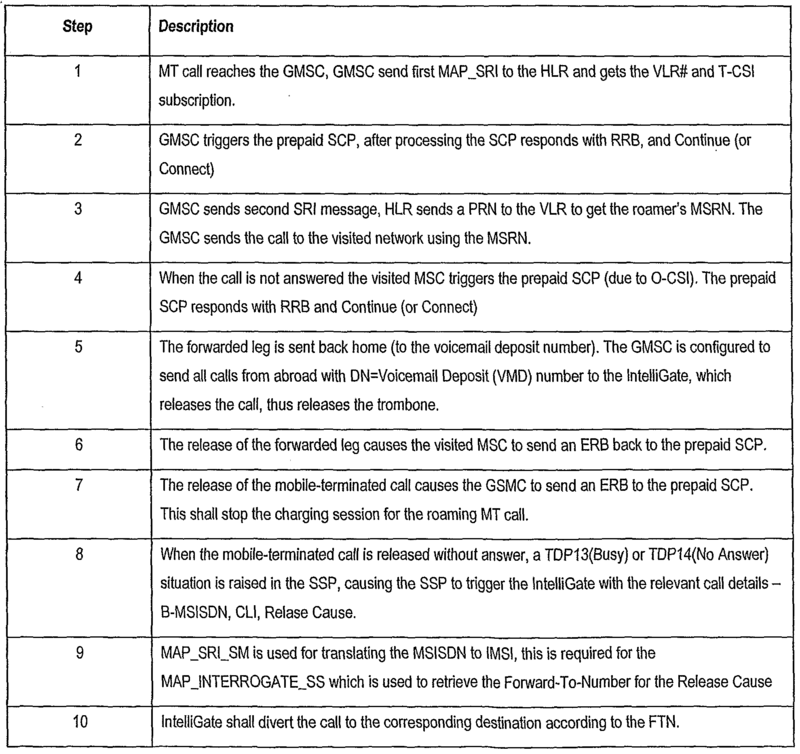 Summarizing the 3rd method, the call is routed to the mobile handset. If the handset is busy or does not answer, then the call is forwarded to the FTN destination, which is typically a voicemail. Then the International leg of the call that reaches the voicemail is disconnected. At that point, the TDP 13/14 trigger arrives at the roaming gateway or Intelligate, asking what to do. As mentioned above, there are two main steps involved, firstly disconnecting the trombone, and secondly obtaining the trigger. A fourth method is based on Standard Optimal Routing (SOR), otherwise referred to as standard-based late call forwarding. SOR is the optimal routing system defined in the GSM standard that was always intended to avoid the existence of tromboning. Standard optimal routing is supported by certain International switches, particular those provided by Ericsson. Such optimal routing typically only works if the switches at both networks have SOR support and this is rare. The ETSI/3GPP standard 23.079, the contents of which are hereby incorporated by reference, provides the description for the optimal routing of late call forwarding, using the Support of Optimal Routing (SOR) feature. This standard solution requires interoperability between the home network or HPMN and the visited network or VPMN, in order to provide the service. The present solution eliminates the need for such cooperation between the home network and each one of the visited networks. Such cooperation has not happened so far, due to the complexity of upgrading the network components to support this feature, and the requirement of having agreements to be signed with all visited networks or a portion of them. The present solution comprises placing apparatus at the home network which emulates SOR functions. If the roaming network has SOR then the roaming network simply produces the necessary signals to provide optimal routing and allows the home network to respond to these signals. The apparatus is not required to do anything when the roaming network has SOR. If, on the other hand, the roamer is in a network without SOR support, then the apparatus sends to the home network signals that simulate the roamer having SOR. In essence the apparatus serves as a home network based SOR emulator, for providing the SOR signaling that the roaming network should be providing but does not. Upon receipt of this signaling the home network is able to connect the caller directly to the voicemail. Equipped with such apparatus the home network sees all roaming networks as having SOR support. It is noted that in the above solution, the home network has SOR capability. However for the present solution the SOR feature need only be activated in the HLR and the GMSC. SOR does not need to be activated in all of the MSCs, as it would be in the general SOR solution. The method is described in greater detail hereinbelow, where it is explained how probes can be used by the emulator for it to obtain the information it needs in order to carry out the emulation. - INAP / ISUP There now follows a description of three methods for disconnecting the trombone. VLR, using the MAP Insert Subscriber Data message. Canceling the FTN preferably causes the first international leg to disconnect without creating the tromboning in the first place. A third way to disconnect the trombone comprises setting a CAMEL trigger to the subscriber, at the roaming VLR. In that case, the roaming gateway or Intelligate receives a trigger before setting the second leg to the voicemail or the FTN. In this case a trigger is obtained before the disconnect occurs, but then the TDP 13/14 trigger is obtained later on, after the disconnect. In all the above three methods, the TDP 13/14 trigger is received after the trombone disconnects. In fact, the same applies to the other methods explained herein including the TDP 12, the IN service broker, and the SOR, the latter of which is explained below. In the following is a description of the two signaling options referred to above, IN and ISUP. Using the IN architecture, the IntelliGate 22 controls mobile terminated calls delivered to outbound roaming subscribers. The IN solution suits networks that are already IN or CAMEL ready, that is IN or Camel compatible, and/or networks that experience relatively high outbound roaming traffic. Using INAP or CAP protocols, call control is performed using a combination of Trigger Detection Points and Event Detection points. 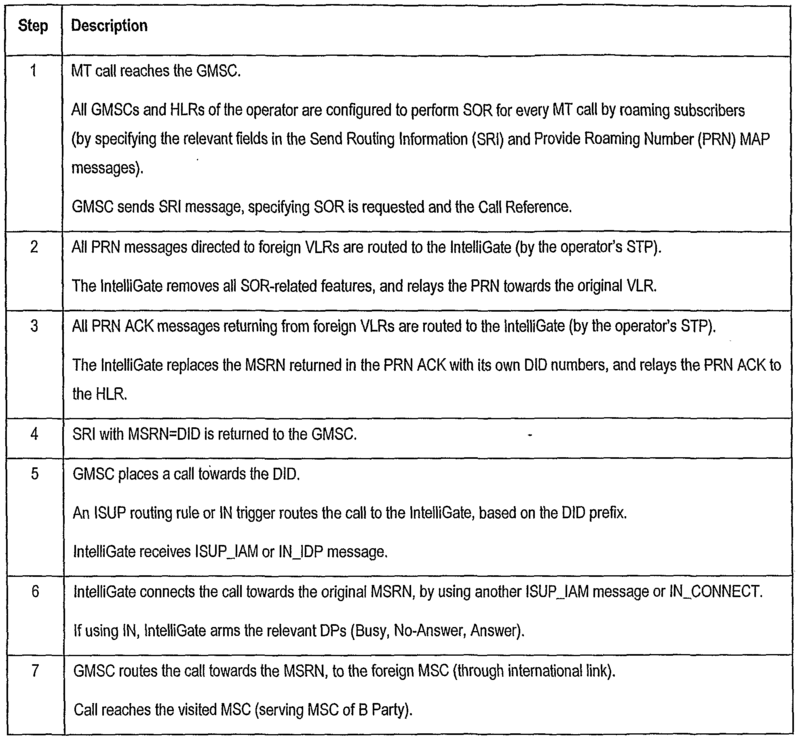 In particular cases - such as: a non-IN network environment, cases where there is relatively low outbound roaming traffic, or, when specifically requested by the operator, call control is performed using ISUP signaling - In this case all MT roaming calls are physically routed to the Intelligate platform. The Loop Around method is a much better method, where only the ISUP signaling is routed to the Intelligate, while the physical voice part actually stays on the MSC. This is achieved by connecting the El/Tl lines back to the MSC, creating a physical loop. This method avoid the transfer of the huge amount of voice traffic to the Intelligate, by having a "semi IN" solution. Referring again to Fig. 2, Intelligate 22 typically comprises an SS7 Mobility Probe 28 to monitor International signaling links. Thus, the IntelliGate is connected to the operator's international SCCP signaling links in a completely passive mode. The probe interface obtains for the OVMD from the signaling links the relevant subscriber information, such as the MSISDN and the forwarding-to-number (FTN) referred to above. It is noted that in many networks, the OVMD service can be implemented without using a probe and probe interface to monitor the signaling links. Considering Fig. 3 again and the service comprises the two separate logical parts of disconnecting the trombone and receiving a trigger which enables the local routing to a voicemail (or another preferred FTN) or call disconnect The different embodiments discussed herein may be mixed and matched in whatever way is most appropriate to provide a highly customizable solution to support different networks and constellations of networks in terms of diverting calls to voicemail as well as in releasing the forwarded trombone. Methods for Releasing the Trombone. Above was discussed in general terms the issue of releasing the trombone. One of the alternatives for releasing the trombone is explicitly to release the returning leg of the trombone. A set of methods for releasing the returning leg of the trombone waits until the forwarded call returns from the visited network and only then releases the call, thus causing the release of the trombone. In one method, a routing rule/IN trigger is defined in the GMSC 24 for all incoming calls from abroad with a specific DN value. 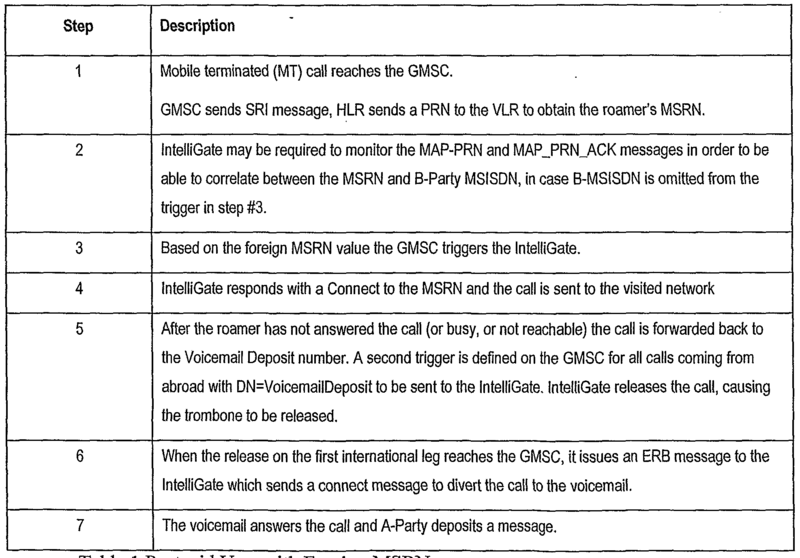 The DN value would be a pointer to the Voicemail Deposit number, and the trigger is handed to the IntelliGate 22. The Intelligate 22 then releases the call. Another method is similar to the above. However, instead of triggering the IntelliGate 22 the GMSC 24 itself has the capability of releasing those calls. To provide the GMSC with such an ability, a special patch may need to be installed in the GMSC. Yet a further method intercepts CAMEL O-CSI triggers coming from the visited network before the trombone occurs and releases the mobile-forwarded calls, thus causing the trombone to be released. It will be appreciated that such a method requires the visited network to produce such triggers. Suppression of FTN while roaming. One method to prevent tromboning is to suppress the FTN and such suppression may be carried out in a number of ways including the following. The FTN may be suppressed by the HLR 26. A feature in the HLR that causes the HLR not to send the FTNs is the MAP_ISD message that is used when the subscriber is roaming. Another method for suppressing the FTN relies on * the IntelliGate 22 monitoring MAPJtSD messages sent by the HLR 26. After each MAP_ISD message is sent by the HLR 26 to the VLR at which the roaming user is located, the IntelliGate 22 issues a consecutive MAP_ISD message in which the FTN is marked as disabled. Such a disablement prevents the VLR, which is at the visited network, from forwarding unanswered calls. Thus the trombone is never formed in the first place. A further method is applicable when the IntelliGate 22 itself handles mobile terminated (MT) calls before they leave the home network 20, also referred to as the HPMN. The method involves DP 12 redirection using the redirection counter field of an initial address message (IAM). When the call is sent to the visited network, IntelliGate 22, which is handling the call is able to place a maximum value in the redirection counter field in the IAM message. The OVMD preferably includes a variety of methods for diverting unanswered calls to the voicemail (or other destinations). Due to the variance between mobile networks, each solution may best suit specific networks, and a complete package preferably includes multiple options. 1. IN-based solutions a. Double Triggering on DP 12 b. IN Service Broker for DP 12 c. Call status triggers such as "call busy" or "no. answer"
GT translation rule in the STP and the IntelliGate 22 responds with a CAP-Connect message with a predefined prefix on the directory number (DN) to activate the second trigger in the MSC based on this prefix. Postpaid Call Flow based on a Foreign mobile station roaming number (MSKN) is illustrated in the figure and the flow is explained according to table 1 below. Reference is now made to Fig. 5 which is a schematic diagram illustrating the process flow when a prepaid roamer is roaming in a roaming network (VPMN) which is Camel enabled. In such a case the Camel provided IDP trigger may be used. Fig. 5 is explained with reference to table 2 below. Reference is now made to Fig. 6, which is a simplified schematic diagram illustrating the case of the prepaid roamer who is roaming in a network which is not Camel enabled. In this case the double triggering method referred to above is used based on adding a prefix to the DN value. The flow is explained with reference to Table 3 below. It is noted that while the visited network is not Camel enabled, the home network may be, and the case illustrated is that in which the home network is Camel-enabled. Reference is now made to Fig. 7, which is a simplified diagram illustrating the service flow for a prepaid user in a Camel-enabled visited network where an IN service broker is used as the initial target of a trigger. In many cases a subscriber can have only one subscription-based trigger in the HLR. This means that in theoiy a subscriber can have only one application in the network that can be triggered. That is to say only one SCP can obtain the trigger. The purpose of having an IN Service Broker component in a network is to receive the trigger and then send out multiple triggers based thereon. In other words the broker can split the single trigger into multiple SCPs to be able to provide multiple services with a single subscription trigger. As the DP 12 trigger is already taken for prepaid mobile-terminated calls while roaming, an IN Service Broker can be used in order to allow another service such as Optimal Voicemail Deposit for prepaid roamers to share the same DP 12 IN trigger. In the following are discussed the call flows of the service when an IN Service Broker is in use. It is noted that the service broker is totally separated from the OVMD Service, logically and even physically. 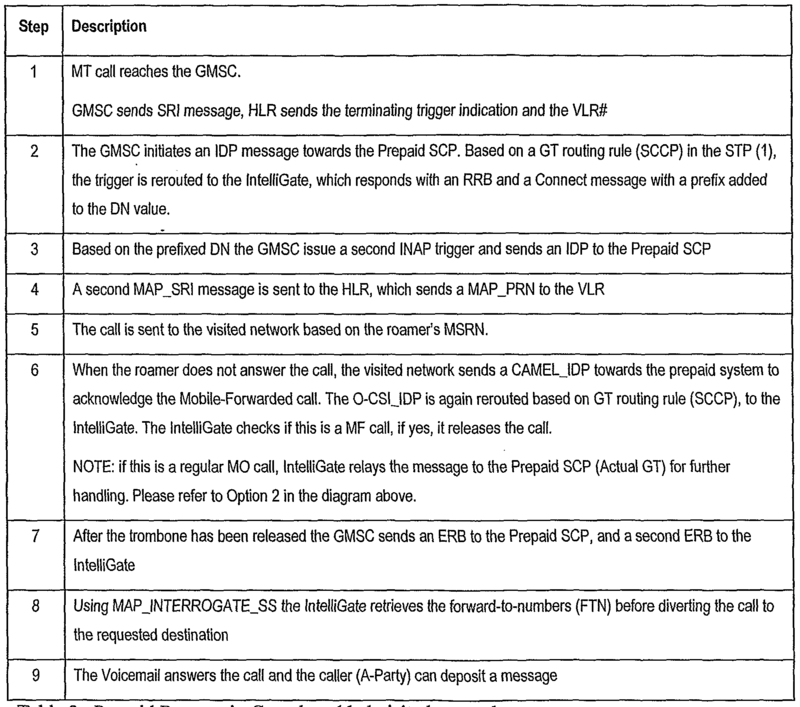 Figure 7 illustrates the call flow for a prepaid roaming user in a CAMEL enabled VPMN, and shows the use of the IN service broker to provide two triggers. 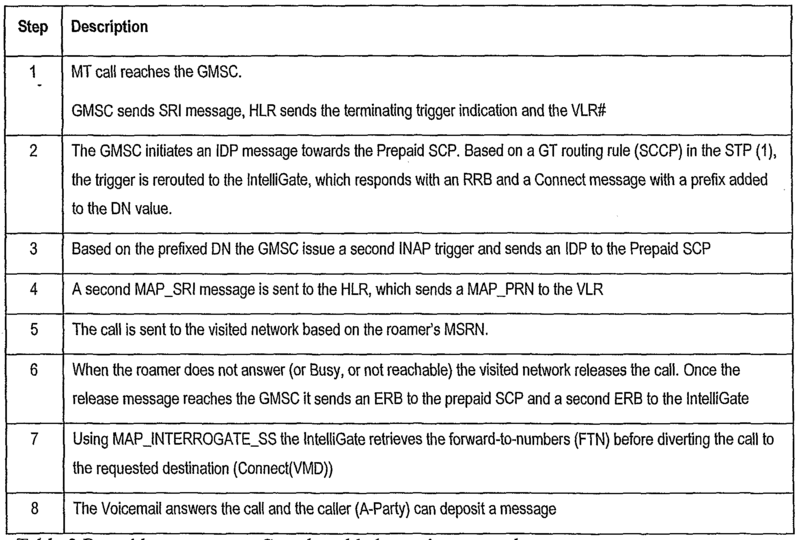 The call flow is explained in table 4 below. MT call reaches the GMSC. 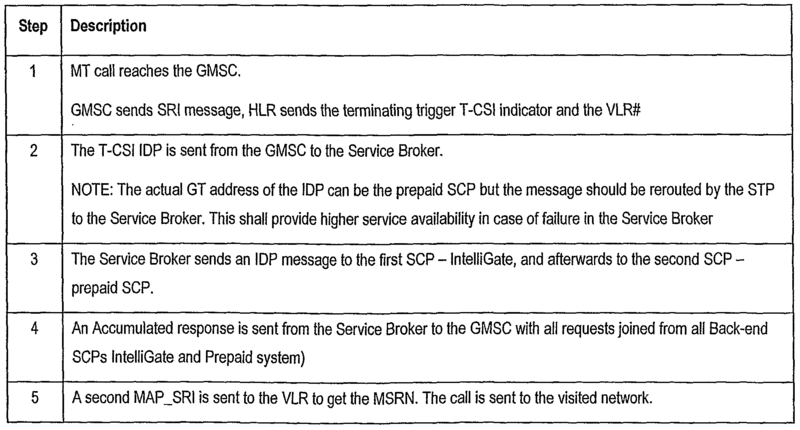 The T-CSI IDP is sent from the GMSC to the Service Broker. Table 4 Prepaid Roamer in Camel enabled visited network using IN service broker. Reference is now made to Fig. 8, which is a simplified diagram illustrating the case of the use of an IN service broker for a prepaid roaming user located in a roaming network which is not Camel enabled. The flow is explained in Table 5 below. 6 When the call is not answered, it is released because the VPMN has no CAMEL relationship with the HPMN. 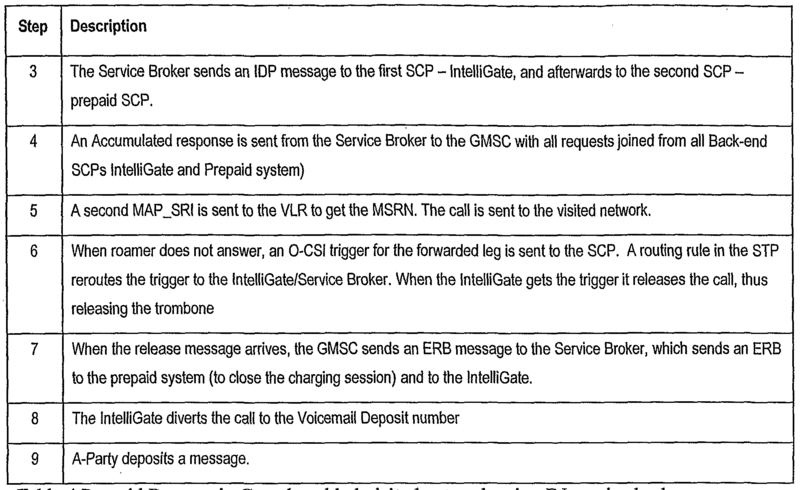 7 When the release message arrives, the GMSC sends an ERB message to the Service Broker, which sends an ERB to the prepaid system (to close the charging session) and to the intelliGate. 9 A-Party deposits a message. Table 5 Roaming user in non-Camel roaming network with use of IN service broker. In the following are described different service flows for the methods based on making use of the call status triggers as outlined above. Specifically, use is made of INAP/CAP call status triggers, such as the triggers for "call busy" or "call not answered". By using these triggers, the service overcomes the conflict with other services that use the TDP 12, such as: Prepaid, Call Screening, VPN, etc services. The system is based on the TDP 13 and TDP 14, that is the busy and no answer triggers respectively. Reference is now made to Fig. 9, which is a simplified diagram illustrating the service flow when the roamer is a postpaid user. The flow is explained with respect to table 6 below. Table 6 Call Termination Triggers with Postpaid User. Reference is now made to Fig. 10, which illustrates a variation of the call termination trigger, TD13 and TD14 approach in the case of a prepaid roamer who is roaming in a Camel-enabled roaming network. The flow is explained with respect to table 7 below. Table 7 Call Termination Triggers with Prepaid User, Camel-Enabled roaming network. Support for Optimal Routing with all visited networks. That is to say the emulator supplies the signals that the visited network is supposed to supply but usually does not in order to provide optimal routing. As a result of using the emulator the home network sees a universe of neighboring networks which all appear to behave as if they are SOR compatible and thus tromboning can be prevented. The emulator preferably uses probes that monitor the International signaling links and is thus able to obtain sufficient information to provide the emulation. Typically the emulator uses the SCCP relay module for relaying specific MAP messages before the call is initially routed to the visited network. Reference is now made to Fig. 11, which is a simplified schematic diagram that illustrates the process flow with a SOR emulator that uses probes when a postpaid roaming user is located in a Non CAMEL VPMN that is not SOR compatible. It will be appreciated that if the VPMN is SOR compatible then the emulation does not need to do anything. GMSC sends SRI message, specifying SOR is requested, the Call Reference and the GMSC Address. Table 8 SOR emulation for a postpaid User in non-SOR compatible, non-Camel Roaming Network, using a regular probe. Reference is now made to Fig. 12 which illustrates SOR emulation in the case that a postpaid Roamer is located in a Non CAMEL visited network VPMN. An SCCP Relay is used, as opposed to the probe in the embodiment of Fig. 11..
Table 9. SOR emulation for a Postpaid roaming user in a roaming network which is neither Camel nor SOR enabled. The emulator uses an SCCP relay. All of the optimal voicemail deposit methods have the advantages that they eliminate tromboning, meaning they bypass international leg for voicemail, significantly reducing costs to the subscriber. They thus encourage greater use of the mobile phone and voicemail, in particular by optimizing user experience and significantly reducing voicemail deposit costs. In each case described there is no dependency on the visited network since different workflows are available for each different visited network configuration. That is to say the same solution enables the elimination of voicemail trombone and recovery of lost revenue without any dependency on the visited network. It is expected that during the life of this patent many relevant devices and systems will be developed and the scope of the terms herein, is intended to include all such new technologies a priori. It is appreciated that certain features of the invention, which are, for clarity, described in the context of separate embodiments, may also be provided in combination in a single embodiment. Conversely, various features of the invention, which are, for brevity, described in the context of a single embodiment, may also be provided separately or in any suitable subcombination. Although the invention has been described in conjunction with specific embodiments thereof, it is evident that many alternatives, modifications and variations will be apparent to those skilled in the art. Accordingly, it is intended to embrace all such alternatives, modifications and variations that fall within the spirit and broad scope of the appended claims. AU publications, patents, and patent applications mentioned in this specification are herein incorporated in their entirety by reference into the specification, to the same extent as if each individual publication, patent or patent application was specifically and individually indicated to be incorporated herein by reference. In addition, citation or identification of any reference in this application shall not be construed as an admission that such reference is available as prior art to the present invention. 1. Apparatus for management of optimal voicemail deposit to the voicemail of currently roaming mobile telephony user during late call forwarding, the apparatus being located at the home network of said user, the apparatus comprising: a triggering unit configured to set a trigger for a mobile terminated call directed to a subscriber of the home network roaming in a visited network, such that when the call is disconnected, the control of the call is handed over for direct forwarding, said setting being irrespective of triggering being required for other purposes; a disconnection unit for disconnecting an international link in a mobile terminated call following subjecting of said call to a late call forwarding; a direct forwarding unit for forwarding a caller to said voicemail, thereby providing an optimal voicemail deposit. 2. The apparatus of claim 1, wherein said triggering unit is configured to ensure said trigger signal is set in cases where at least one other service requires triggering. 3. The apparatus of claim 1, wherein said triggering unit is configured to convert a roaming trigger signal into a double trigger signal. 4. The apparatus of claim 3, wherein said converting comprises adding a prefix to said trigger signal. 5. The apparatus of claim 1, wherein said triggering unit is configured to detect at least one of a call busy and a no answer signal from said roaming user and to use said detected signal as said trigger signal. 6. The apparatus of claim 1, wherein said triggering unit comprises a broker configured to receive a roaming trigger signal and to send out at least one outbound trigger signal in response, thereby making said trigger signal available. 7. The apparatus of claim 6, wherein said broker is configured to look at a user profile and thereby select a number of outbound trigger signals to send. 8. The apparatus of claim 7, wherein said broker is configured to look at a user profile and thereby select destinations for said outbound trigger signals. 9. The apparatus of claim 1, wherein said triggering unit comprises an emulator for emulating Standard Optical Routing signals from the roaming network. 10. The apparatus of claim 9, wherein said emulator is connected to a signaling probe, thereby to obtain international signaling data. 11. The apparatus of claim 9, wherein said emulator is connected to a signaling relay of international signaling data. 12. The apparatus of claim 1, wherein said direct forwarding unit is configured to obtain a forward to number (FTN) of said roaming user. 13. The apparatus of claim 1, wherein said disconnection unit is configured to obtain a voicemail deposit destination number of a late forwarded call. 14. 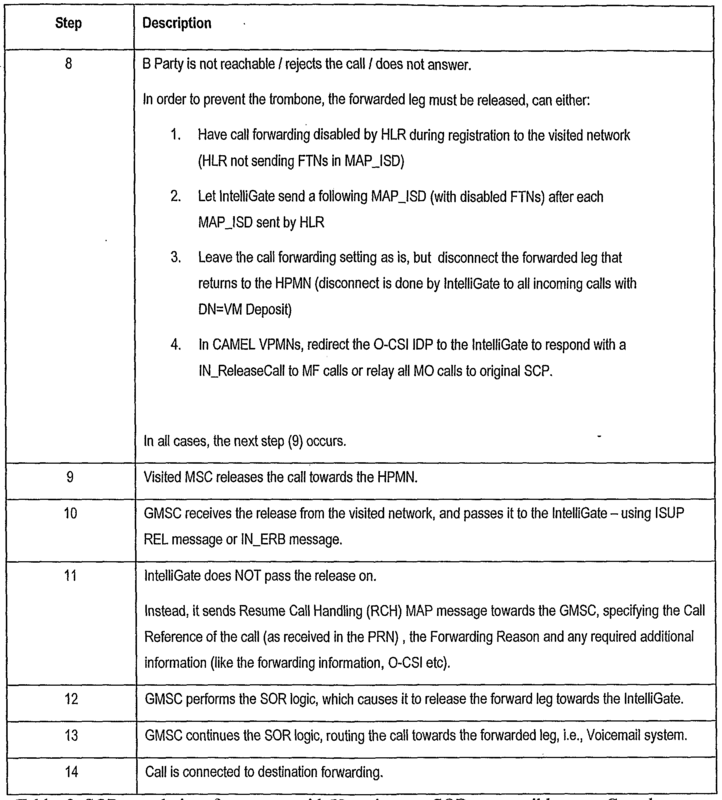 The apparatus of claim 1, wherein said disconnection unit is configured to determine whether said roaming network is or is not Camel-enabled, thereby to select between respective Camel and non-Camel procedures. 15. Method for management of optimal voicemail deposit to the voicemail of currently roaming mobile telephony user during late call forwarding, the method being carried out at the home network of said user, the method comprising: providing a trigger signal for passing control of a late forwarded call to allow direct forwarding to a respective voicemail; disconnecting an international link associated with said call; and using said trigger making said direct forwarding to said voicemail. 16. The method of claim 15, comprising converting a roaming trigger signal into a double trigger signal. 17. The method of claim 16, wherein said converting comprises adding a prefix to said trigger signal. 18. The method of claim 15, comprising detecting at least one of a call busy and a no answer signal from said roaming user and using said detected signal as said trigger signal. 19. The method of claim 15, comprising configuring a broker to receive a roaming trigger signal and to send out at least one outbound trigger signal in response, thereby making said trigger signal available. 20. The method of claim 19, wherein said broker is configured to look at a user profile and thereby select a number of outbound trigger signals to send. 21. The method of claim 20, wherein said broker is configured to look at a user profile and thereby select destinations for said outbound trigger signals. 22. The method of claim 15, comprising emulating Standard Optical Routing (SOR) signals from the roaming network. 23. The method of claim 22, wherein said emulating is based on International signaling detected by a probe. 24. The method of claim 22, wherein said emulating is based on international signaling data obtained from a relay. 25. The method of claim 15 wherein said voicemail is reached by obtaining a forward to number (FTN) defined for said roaming user. 26. The method of claim 15, wherein said voicemail is reached by obtaining a voicemail deposit destination number of a late forwarded call. 27. 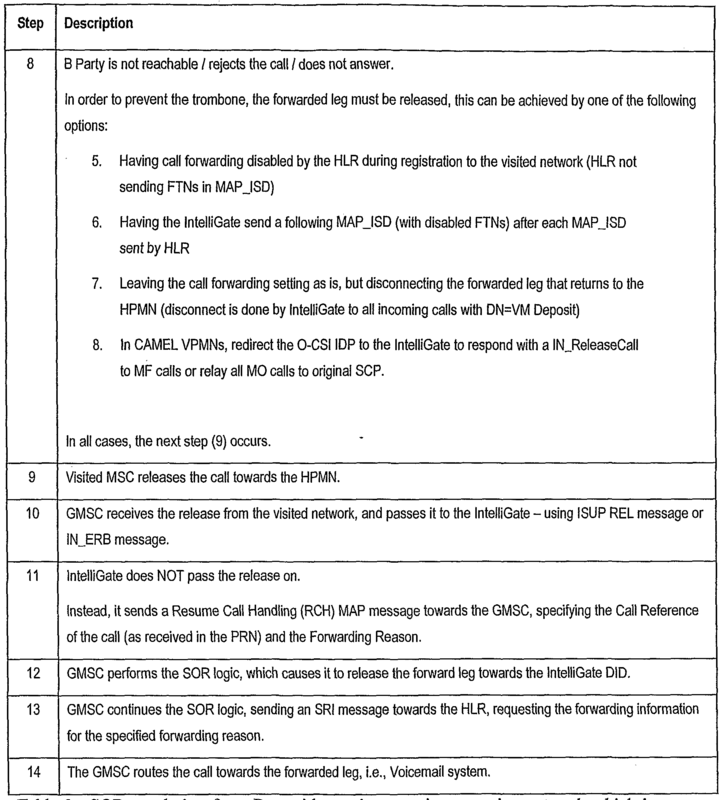 The method of claim 15 comprising determining whether said roaming network is or is not Camel-enabled, thereby to select between respective Camel and non-Camel procedures. FR2673728B1 (en) 1991-03-08 1997-01-31 Assistance Publique gamma camera system has high sensitivity. MX9201267A (en) * 1991-03-29 1992-10-01 Ericsson Telefon Ab L M Traceroute auxiliary communication service. FR2693803B1 (en) 1992-07-17 1994-09-30 Popescu Gheorghe apparatus for detecting and locating radioactive biomarkers. ES2340850T3 (en) 2010-06-10 Terminated call control for roaming mobile subscribers. ES2354722T3 (en) 2011-03-17 csi dynamic generation of information for inbound roamers.